One of those annoying situations that can happen on your computer is accidentally deleting a file you still want and didn’t mean to remove. Emptying the Recycle bin is easily done if there’s other things diverting your attention at the same time. Most people would resign themselves to accepting the fact it’s lost forever, thinking that once the file is not there anymore, that’s it. But it’s not completely true where Windows is concerned and files can often be recovered. Many people are not aware that when a file gets deleted from Windows, it hasn’t actually gone anywhere. Because of the way Windows handles files it means deleted files aren’t in fact touched at all, but are instead simply marked by Windows as deleted and therefore ignored from the then on. This means all that has to be done for the file to be recovered, is for Windows to be told it’s not deleted anymore and is a normal file again. There is a problem though, when Windows marks the file for deletion, it also makes the space being used by the file free and available to the system again meaning at any time the file could be overwritten. When that happens, the chances of getting the file back are practically zero. So, it’s basically a race against time for you to get the file back before Windows or another piece of software can write over it. This obviously gives you a better chance of recovering a recently deleted file as opposed one from several days ago. If you accidentally deleted files that you need, it is very important to use your computer as little as possible until they are recovered, because any hard drive action from now on could potentially overwrite the file. If possible try not to use the internet or download files either for the same reason. The safest option for now would be to use another computer until after the recovery especially if you’re trying to undelete critically important files. Piriform have developed some great freeware utilities such as the cleaning and optimizing tool CCleaner, the defrag tool Defraggler and the user friendly sysinfo tool Speccy. 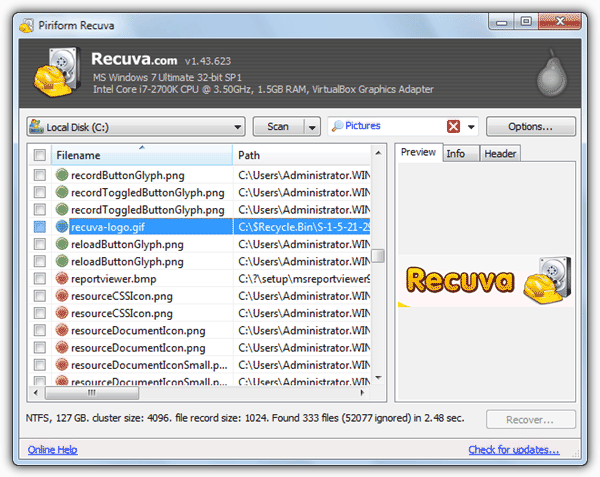 Another one is a file undelete and recovery tool called Recuva. 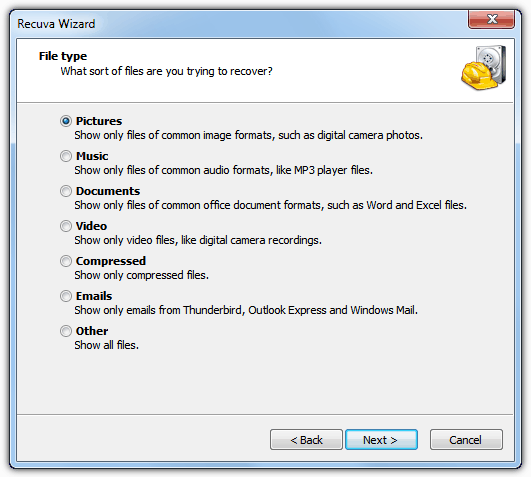 And while it is does a great job getting back lost files on Windows hard drives, Recuva is just as effective undeleting files from USB sticks, camera or mobile phone memory cards and even MP3/MP4 players. The program’s website has both installable and portable versions of the program available, but if the affected files are on your C or system drive, I would recommend you download the portable version to an external media such as a USB stick and extract the zip file on there. The third window will offer a “Deep scan mode” which is a more thorough search for the deleted files, but take several times longer to scan. This option should be used only after a normal scan has failed to find your files. After searching for all deleted files in the chosen location, you will now be at the main window. If you skipped the wizard, this window will be empty for now until you perform a scan. To start a new scan is easy and all that’s needed is for you to select a drive to scan from the drop down and optionally enter a filter, there are some pre-configured ones available for images, video, documents etc, or you can enter your own. Then simply click the Scan button which also has a drop down with an extra function of being able to search for a string inside the file’s content as opposed the the file name. 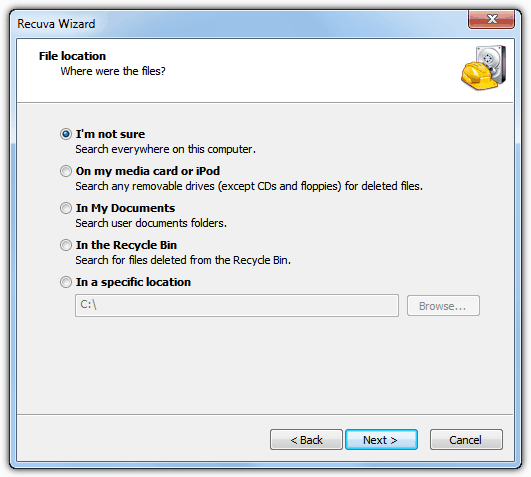 Whether you used the wizard or the manual scan method, after the scan the main window will now become filled with all the files Recuva has found. The colors next to each file are simply to represent the chances of that file being recovered; green is an excellent chance of recovery, orange is a fair chance, and red is almost no chance and the file isprobably lost. 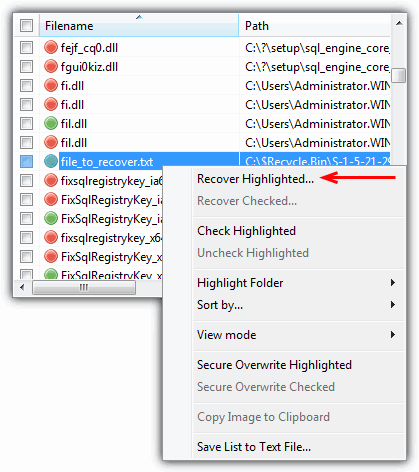 Recovering a single file is only a matter of finding it in the list, right clicking on it and selecting “Recover Highlighted…”. You will then be asked for a destination to save the file to which SHOULD NOT be the same drive as recovering the file from or you could overwrite the file. Use the tick boxes provided or Shift+click for the selection of multiple or ranges of files and then use “Recover Highlighted” or “Recover Checked”. If you can’t find your file in the list, then there you may need to run a Deep Scan although it takes a lot longer because the whole drive is scanned as opposed to only the Master File Table in a normal scan. There are limitations in that it can only recover non fragmented files of a common file type such as .doc, .jpg, .mp3 etc. Also the original file name cannot be recovered. Recuva also has another useful function which is secure deletion that can overwrite files you want permanently gone several times so they CANNOT be recover again. There is also a good chance Recuva can recover files from corrupt, formatted or damaged partitions, go to Options -> Actions tab and tick “Scan for non-deleted files”, then run a scan as normal. Non deleted files then show in the main window as double circle green icons. Recuva runs on Windows 8, 7, Vista, XP and 2000. 32-bit and 64-bit versions are available in the portable version and the installer will install the 64-bit version if your system supports it. Would like to say BIG THANK YOU to those developed “recuva” data recovery that turn the world into a brighter place as a free software benefiting lot more people. This helped me restore some accidently deleted .dll’s, thank you so much recuva!!! My flash games work again. i like this software,as it’s very usefull.